Why use Essential Skin Face and Body Brush Cleansing System? What’s to say about its performance? What do you get? What are the features? What are our favs? What we don’t like at all? Simply using the right skin care products isn’t going to cut it and you need to step up your game if you’re determined to have healthier and younger skin. One of the steps you need to include in your daily skin care routine is a good face cleansing brush. Not only able to remove dirt, oil and other impurities, this little tool is also going to prime your skin for the following cosmetic products, improving their performance and increasing their absorbency. It may be its popularity that speaks volume, but the face cleansing system by Essential Skin Solutions is much more than a popular choice. Easy to use, reliable and efficient, the whole face and body brush cleansing system cleanses your skin well and comes for an attractive price too. A closer look at its features, build and performance helps you get it why this particular face cleansing system is always an option to consider when in need. The facial cleansing brush cleanses deeply your skin’s pores and makes them smaller, but also keeps at bay acne and breakouts. When you’re using the cleansing brush, you’re going to notice that the blackheads and dark spots are slowly fading out. 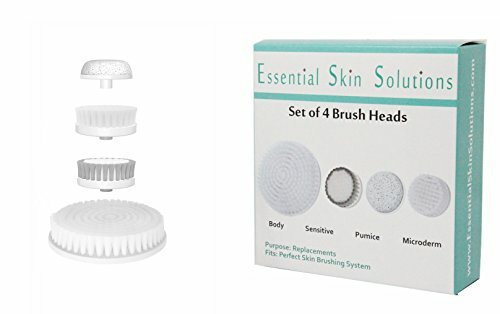 As it comes with two facial exfoliator brushes that address various skin types, the skin brushing system is going to eliminate dirt, oil and flaky skin, which translates into healthier and younger looking skin altogether. The exfoliating body brush included in the system it’s not just minimizing, but it also reduces the risk for occurrence of body acne on back, chest and arms. The whole system is in fact a great choice for the sensitive and acne-prone skin. The face cleansing brush acts like a reliable skin corrector as exfoliation is an important step into having cleaner, clearer and fresher looking skin. The dermabrasion machine fights against aging and makes the fine lines and wrinkles (which are the first signs of skin aging) less noticeable. If you’re struggling with some dark brown spots or age spots, you can put your trust and faith in to the sonic spin brush kit as it’s going to reduce their visibility too. On top of everything else, the cleansing system improves circulation and tightens the skin, lowering the risk for ingrown hairs. If you’re planning to apply sunless tanner, the system is a great little tool to use for ensuring even application. 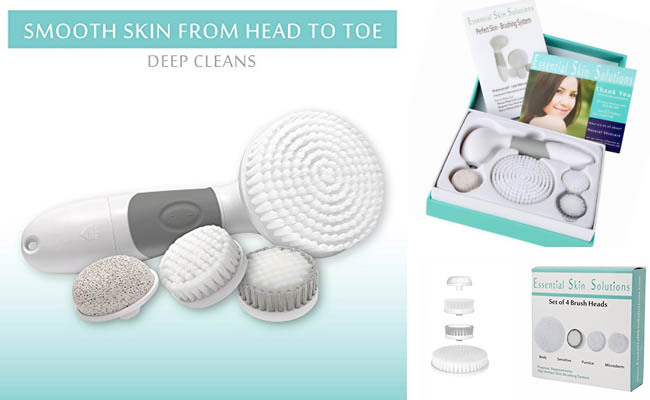 The system includes the cleansing unit, the exfoliating body brush, the microdermabrasion facial brush and some other accessories useful for various skin care related jobs. The cleansing unit is cordless and battery operated and it runs on AA batteries. It has a good build and an ergonomic design. This is why it’s easy to hold and it provides a sturdy grip as well. The accessories are easy to remove and switch, increasing the versatility of the cleansing system. The cleansing brush is waterproof so you can use it in the shower for the complete sonic skin exfoliation. You can definitely use the sensitive brush for daily skin care routine. The face and body cleansing system leaves your skin soft, smooth and cleaner, improving your skin complexion as well. All skin types may benefit from it and the system works even for rosacea and acne-prone skin. The brush doesn’t cause irritation and feels soft on skin. We need to pinpoint the packaging too that makes a nice impression every time. Easy to use, reliable and dependable for so many skin care related jobs, the face cleansing brush and system isn’t an option to miss when in need. Lacking the adjustable speed, the cleansing does compensate with its reliable performance and attractive price. See also our related posts: the Clarisonic Mia 2 Cleansing Brush, the Prox by Olay Advanced Cleansing System, the Lavo Giro Facial Cleansing Brush, the Foreo Luna Mini2.